INFANT BAPTISM: Baptisms are celebrated, as scheduled, either during or after the weekend Masses. Call the parish office to schedule a baptism. Parents attend a Baptism Preparation Class prior to their child's baptism. Parents are welcome and encouraged to attend before their first child's birth (Parents need to attend only once--not with each child). The parish has the responsibility of ensuring that infants baptized into the Catholic Church will be raised in the faith; therefore, there must be evidence of personal active faith and the commitment of Catholic parenting. ADULT BAPTISM (Rite of Christian Initiation for Adults): From September to Pentecost, the RCIA program enables people to learn about the Catholic faith. Those involved meet on Tuesday evenings. On the First Sunday of Lent, they publicly indicate if they wish to enter the Church at Easter. Arrangements to begin the RCIA program can be made by calling the Parish Office. Homebound parishioners and those in hospitals or nursing homes are welcome to call the Parish Office to arrange to have weekly Communion brought to them. Preparation for First Eucharist ordinarily occurs in second grade. Preparation for adults takes place through the Rite of Christian Initiation for Adults (RCIA) process. In the Diocese of Evansville, the Sacrament of Confirmation is celebrated during high school. High School students enter the Confirmation Preparation Program, which journeys our young people into discipleship as young Christians. Preparation for adults who have not yet been confirmed is ordinarily done through the RCIA process. If you have questions or special circumstances, please contact the Parish Office. The regularly scheduled time for the Sacrament of Reconciliation is Saturday evening from 5:00-5:30 p.m. Other arrangements can be made by calling the Parish Office. Special Reconciliation services are scheduled during Advent and Lent. Engage couples planning to be married at St. Joseph should contact the Pastor at least six months in advance. Definite plans for a wedding date should not be made until such contact has occurred. 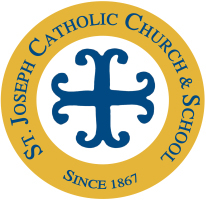 St. Joseph parish has the responsibility of ensuring that marriages recognized by the Catholic Church will be lived in the faith. There must be evidence of personal active faith to serve as a foundation for such a commitment. Marriage preparation involves assessment of the couple's communication and compatibility, assessment of their Church commitment, participation in an appropriate Marriage Preparation program, and planning the wedding ceremony with the presiding priest. A wedding packet must also be obtained from the Parish Office. This sacrament is celebrated at the parish, home or hospital at special request. If you will be in the hospital for surgery or extended care, contact the Parish Office to arrange for the celebration of this sacrament. A priest at the hospital may also be available for this sacrament. Those considering a vocation to the priesthood, permanent deaconate, or religious life are encouraged to contact the Pastor or Diocesan Vocation Office at 812-424-5536.